Want a practical way to turn any tension into more integrity in your relationships? If you watch this video, you’ll get the integrity practice that we use in all of our trainings and throughout our organization to optimize our productivity, mutual understanding, and beyond. If you attend any of our relationship trainings (our core offerings here at the IC), you’ll learn the agreements that we set as a group to make sure we’re all playing the same game together. I’ve received consistent feedback from community members that these agreements transmit the core principles our Integral philosophy here. Instead of just being neat ideas, these agreements allow us to dynamically practice these values and make them real. The first agreement that we set is the most important, since it’s the agreement about agreements–Integrity. It sets the standard for how we relate to the rest of them. While many organizations may hold Integrity as a core value, we actually have a practice for working with it directly. I’ve found this practice to be so powerful, that I believe it’s revolutionary, and I want to get it out there as widely as possible. So I when I was recently with Mark Michael Lewis, the Executive Coach and IC Collaborator who originally helped codify these agreements, I wanted to film this informal video so I could share it with you. Interested in diving-in and practicing with us? 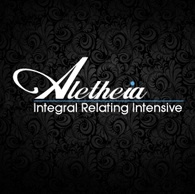 Our flagship weekend training, Aletheia is coming back soon. There’s a $200 early-bird discount available if you schedule a conversation with us here.